I think very few people know that several facades along South Market Street are just that, facades. If you step around back, it looks like a movie set with steel beams holding up the one wall that fronts the street. 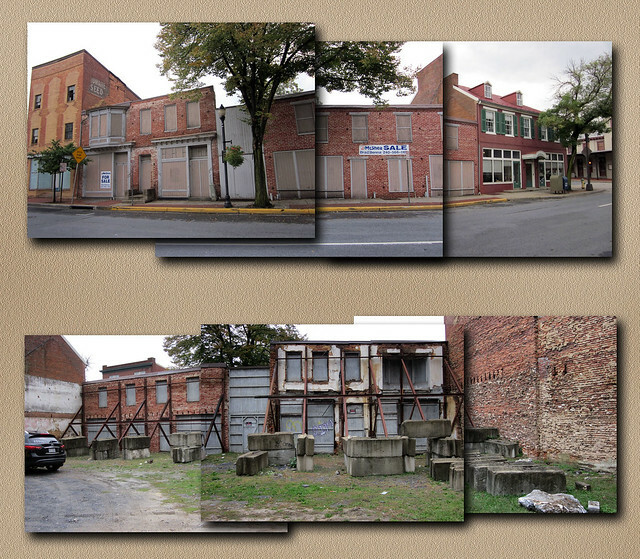 These properties have been like this for decades but were recently auctioned off. Perhaps there will be a bit of new development here in the future. Saw a photo of it once, on this website. What’s with this new, very stark and very un-Frederick look to the site this morning? Ick. Sorry was hacking on something last night and left the default theme up. Also I can’t remember ever posting about the fake facades along market, but I wouldn’t doubt that I would repeat myself after 6 years. I had to go check it out tonight. So bizarre.